Elizabeth Quirk, Denham, La., scored 221 points riding Kattalyst on Wednesday to win the second go-round of the NCHA Super Stakes Classic Non-Pro, and claim the top cumulative score with 437 points. Madalyn Colgrove, Boligee, Ala., who won the first go-round with 221 points, posted a cumulative score of 436.5 points riding Sweet Baby Marie, and Steve Anderson, Victoria, Tex., ranked third with 435.5 points on Littlemak. Quirk, the NCHA Non-Pro Hall of Fame earner of $689,528, most recently won the 2018 NCHA World Series Mane Event with Cat Sheree LTE $179,988. She also placed as reserve champion of the Ike Hamilton Futurity 4-Year-Old Non-Pro on Catillac Reys LTE $60,718. 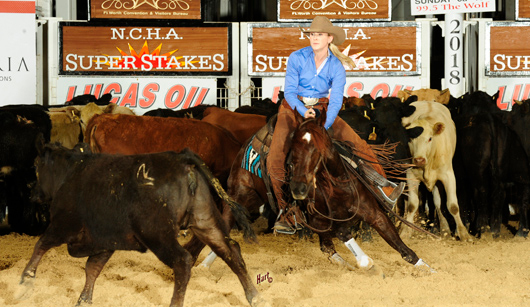 Six-year-old Kattalyst LTE $117,710, a Metallic Cat daughter bred by Alvin and Becky Fults, claimed the reserve championship of the NCHA Super Stakes Classic Open on Sunday, April 1, under Adan Banuelos.